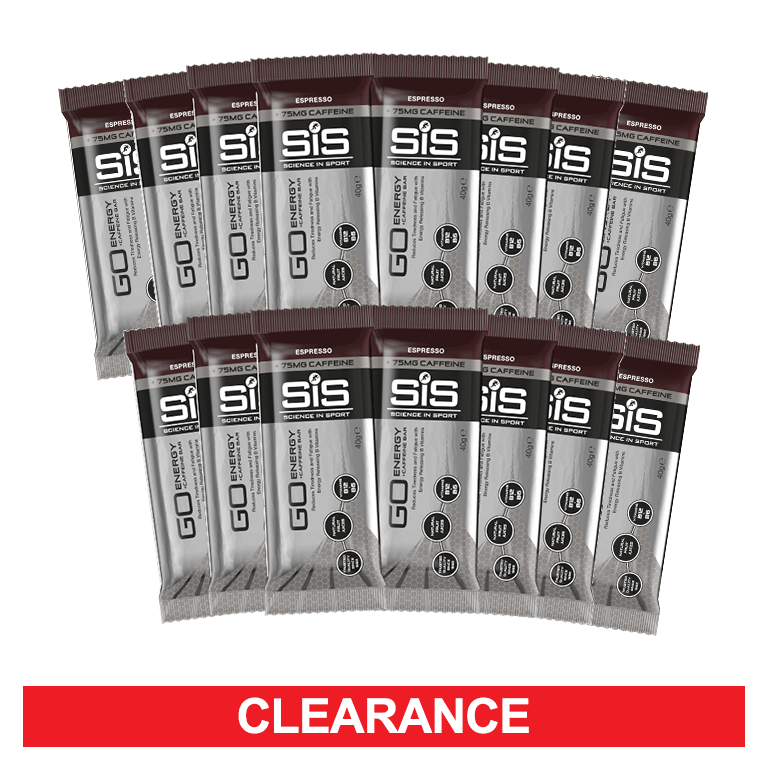 SiS GO Energy + Caffeine bars are a nutritious, easily digestible and high carbohydrate based snack made from fruits and wholesome ingredients.The compact (40g) size provides a practical and nutritious approach to provide carbohydrate during exercise and can be combined with the full SiS GO range. SiS GO Energy + Caffeine Bars are tested under the Informed Sport Certification program. This approach involves testing every single batch of SIS finished product which leaves the Company’s factory, screened against the 2017 World Anti-Doping Agency (WADA) list. Banned substances including steroids are tested to the level of 10 Nanograms per gram, and stimulants to 100 Nanograms per gram. Batches (sampled at the beginning, during and end of each product batch) receive the recognised and respected Informed Sport* certificate and SIS provides the documentation to athletes on request. Concentrated Grape Juice (23%), Maltodextrin (From Maize), Oats (11%), Rice & Soya Crisps (10%) (Rice, Soya, Oats, Salt, Rapeseed Oil), Dates (10%), Raisins (7%), Concentrated Pineapple Juice (7%), Soy Protein Isolate, Emulsifier: Soya Lecithin, Fat-Reduced Cocoa Powder, Natural Flavouring, Caffeine (0.19%), Humectant (Calcium Lactate), B Vitamin Mix (Pyridoxine HCI, Folic Acid, Cyanocobalamin). When should I take these versus any of the gels? With 24g of fast absorbing carbohydrate (per 40g bar), these are best used before short training sessions or competitions as a pre-exercise snack to increase carbohydrate intake and provide caffeine to help reduce the perception of fatigue. When should I take these versus the GO Energy Bar? The GO Energy + Caffeine Bar is based on the great tasting formula of the GO Energy Bar, with additional b-vitamins and 75mg of caffeine. This bar is designed for athletes who are looking to reap the benefits of taking caffeine before or during exercise. Will caffeine benefit my performance? The GO Energy + Caffeine Bar is designed to help deliver carbohydrate for energy and help you improve concentration and alertness. You’ll be ready to tackle hard sessions and perform at your best, no matter what time of day you’re training. If you’re exercising for over 90 mins you should take on additional carbohydrate and consider using caffeine to help reduce the perception of fatigue. This product can be used whenever there is a need for additional energy or when fatigue is high e.g 30-60 minutes before a tough climb or 60 minutes before the end of a race/competition. B-vitamins help to reduce tiredness and fatigue, as well as contributing to a normal energy yielding metabolism. These factors are important during both high intensity and endurance exercise. Yes! GO Energy Bar + Caffeine is lightweight and compact, designed to fit in jersey pockets, cycle bags and waist packs. GO energy bars are not suitable for coeliac and gluten free diets due to their oat content. A 40g GO energy bar contains 12g of naturally occurring sugars from fruit, with no added sugar.